Be The "Middle Man" And Profit With VideoRobot Agency License. Instantly approach any client and WOW them with professional spokesperson videos promoting their business. Add logo, motion animation elements, intros and outros to the spokesperson videos with VideoRobot and "personalize" it to promote any business. Add these HOT niche spokesperson videos to any blog, website or offer to instantly grab the attention of your visitors and get more leads, traffic and sales! Selling just ONE video will pay for your entire membership. 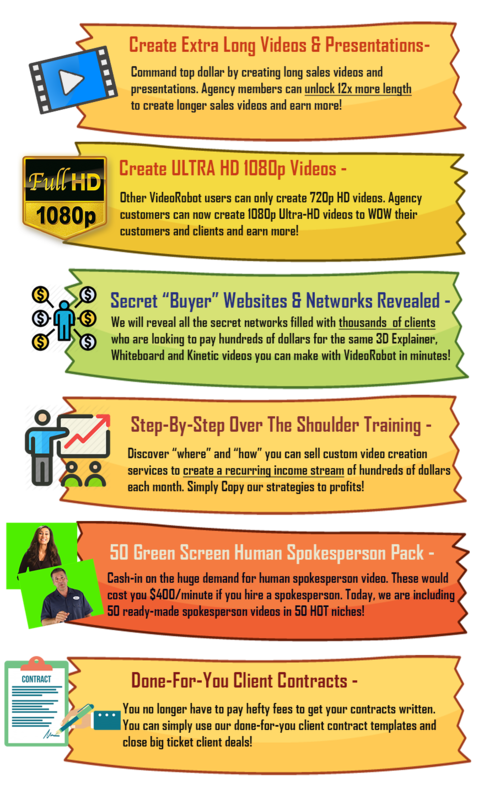 Create stunning professionally designed videos like these in minutes with VideoRobot and sell for $100-$500 each! local business, and bloggers to earn hundreds of dollars in profits per sale.